8-Man Teams, Scores, W-L, Rankings, Etc. The 2019 NHSA National Tournament (8-man Football) will be played in Panama City Beach, Florida beginning on Friday, November 15th and ending on Monday, November 18th. General information about the 2019 NHSA Tournament can be found by clicking here. Registration is now open so please click on the “Team Registration Form” below, fill in the information required and send it in as soon as possible to reserve your spot. Each player must submit the following Player Eligibility Form before they can compete in the tournament. The Laguna Beach Christian Resort in Panama City Beach, Florida is one of the host facilities for the NHSA (8-Man Football) Tournament. All rooms/suites reservations are to be made through your football team who will work with the NHSA office to make all room reservations (do not contact Laguna Beach for rooms/suites). 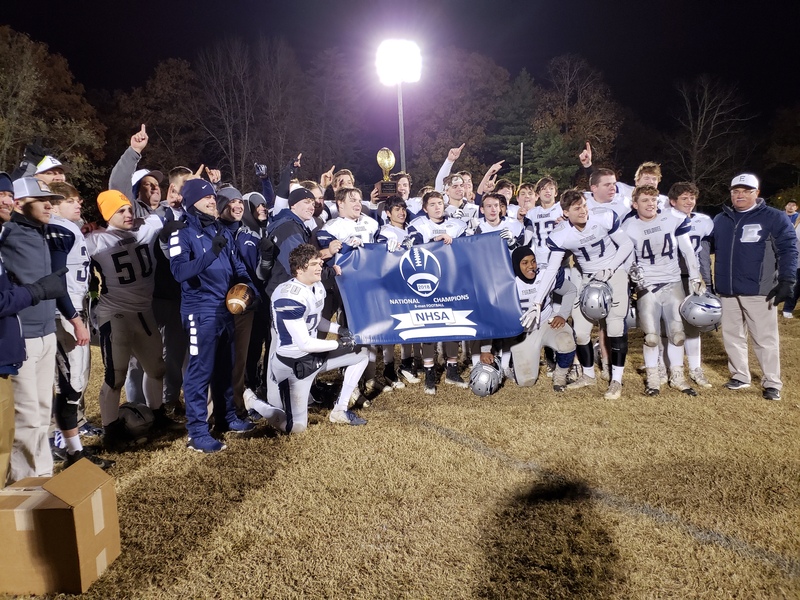 Evangel Christian defeated unbeaten Christian Community 36-20 to win 2018 NHSA National Championship. Christian Community scored first with 3:08: left in the first quarter on a QB Nathan Rowley short run to go up 6-0. Then with 7:38 on the clock before halftime, Rowley’s TD pass to Mark Pugh pushed the score to 12-0 and it looked like the Colts were in complete control of the game. Evangel was able to drive to the 4 yard line near the end of the first half but fumbled trying to get into the end zone. Down 12-0 at halftime, kick returner Dawson Humphries took the second half kickoff and return it for a touchdown and QB Tyler Henderson was successful on the 2-pt attempt to pull Evangel to within 4 at 12-8. Christian Community answered at the 7:08 mark of the 3rd qtr. with a score of their own as Rowley to Pugh connected again for the touchdown then Rowley pass to Isaac Alton tacked on the 2 pt attempt to go up 20-8. Taking the kickoff, Evangel marched down the field scoring on a nice run by Noah Shears to make the score 20-14 with 5:00 left in the 3rd quarter. Both offenses were moving the ball, however, a Rowley to Pugh pitch of the option play was snagged by Dawson Humphries who scored on the pick 6 to tie the score and then was able to get into the end zone on the 2-pt attempt giving Evangel the lead at 22. With Shears doing the heavy lifting, Evangels ground game began to take it’s toll as the Lightning drove down the field and with 8:32 in the fourth quarter scored on a short run by Daniel Viles and Shears scored on the 2 point conversion to give the Lightning a 30-20 lead. Christian Community, who usually wears out teams in the 2nd half, had the tables turned on them as they just couldn’t get the ball into the end zone. Several end zone passes were dropped and Evangel took over. Pounding the rock and content to run the clock, the defense could not stop Shears and with 3;48 left in the game, he broke loose for the final touchdown and a 36-20 lead. Evangel outscored Christian Community 36-8 in the 2nd half to secure the victory and the title of 2018 National Champions over the 2017 National Champions. © 2019 National High School Tournament (8-man football). All Rights Reserved.